This DC motor shield from Infineon AG is a small evaluation board equipped with TLE94112EL for use with Arduino. The TLE94112EL is capable to drive up to 6 small dc motors in parallel mode or up to 11 dc motors in cascaded mode. All outputs can drive up to 0.9A. The outputs can be used stand-alone or combined to increase driving capability up to 3.6A. This evaluation platform is suited for a wide variety of applications such as: multi-motor systems; dc motors and voltage controlled bipolar stepper motors; toys; HVAC systems. The shield can be controlled by a microcontroller via an SPI interface. For example, either an Arduino Uno R3 or the XMC1100 Boot Kit from Infineon can be used as master. 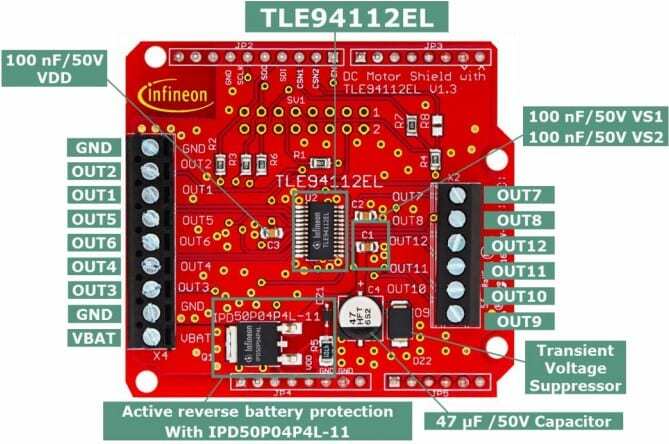 The board features an Infineon TLE94112EL, a twelve-fold half-bridge driver with integrated MOSFETs. Each half-bridge can drive peak currents up to 0.9 A and DC current in the range of 200 mA to 500 mA, depending on the application conditions and the number of activated outputs. The DC Motor Control Shield has an active reverse polarity protection with the p-channel MOSFET IPD50P04P4L-11. 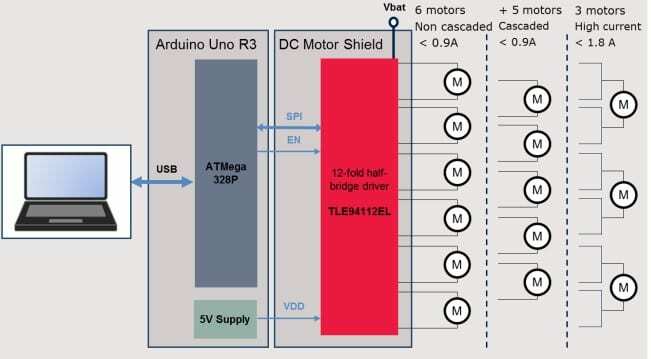 The DC Motor Control Shield can be easily connected e.g. to any Arduino board or to the XMC1100 Boot Kit via headers.